A job notice about NSCBMC recruitment has been dispersed from Netaji Subhash Chandra Bose Medical College to inform efficient and well qualified applicants for 230 vacancies of tax officials, staff nurses, pharmacists, assistants, stenographers. Eligible candidates can apply for the NSCBMC vacancy by filling up the offline application form till the end of December 7, 2018. Job Hunter can go through this page which is the last date that 7th December 2018 is efficient and well qualified, applicants can collect the remaining information about the NSCBMC recruitment 2018 until the NSCBMC application forms It is advisable to present relevant documents along with the team of www.telanganaa.in. Essential qualification: Candidates with the candidates who are willing to apply for NSCBMC job should pass the minimum qualification as 12th PCB / B.Sc / M.Sc Nursing / Diploma (DMT) / Bachelor Degree / CPCT certificate / bachelor degree (library science / computer application) can apply from any accredited board or institute. Candidates applying for the said position and belonging to unreserved category, they have to pay the application fee. 500 / -. Reserved candidates will be exempted from payment of application fee. Candidates applying for the age should be between 25 to 40 years (post 1), 18 to 40 years (2-20 posts). Scale: Candidates who will be admitted successfully will receive attractive and satisfactory salary. 15,600 - 39, 100 / - 5400 / - grade pay (1,2,5 posts), Rs. 9300 - 34,800 / - 3600 / - with grade pay (post 3), Rs. 5200 - 20,200 / - with NSCBMC 2800 / - grade pay (post 4,6-20). 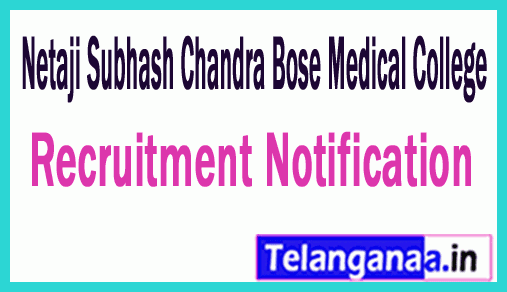 Competitors interested in applying for Netaji Subhash Chandra Bose Medical College recruitment will have to go through a written examination, interview round which will be organized by the organization's recruitment panel. Visitors have to go to the official website to apply for NSCBMC and this is http://www.medicaleducation.mp.gov.in. Application latest to be sent: 07-12-2018. Click NSCBMC Recruitment Notification here.